"We really want to bring home a new kitten, but we're not sure how to introduce him to our home or our existing cat and dog..."
We are often asked this question and there really is no "simple" answer. I've spent hours and hours tailoring introductions for clients based on their specific situations or pets. Just as there are many different cat personalities, there are many different ways to introduce two cats - or a cat and dog for that matter - each with varying time frames and degrees of success. "Success" may mean different things to different families. Do you want your pets to love each other or will it be enough for you if they simply tolerate one another's existence and live with you under the same roof? Either way, I'll go through the steps here that I suggest to our kitten clients when they are introducing one of our kittens to their dog(s) or cat(s) at home. This process may be used for the introduction of any new pet to any home, it's not strictly for use by our kitten clients. It should also be read in conjunction with "Bringing Your Kitten Home" for more ideas on what to have ready for your new kitten and what to expect when you come to pick him up from us. The first thing to do (and something that is written right into our contract as the "quarantine period", so it's not to be taken lightly) is to create a safe room for your new kitten to stay when he arrives in your home. The benefits of the safe room are two fold: 1) the prevention of spread of potential infectious illnesses; and 2) creating a less stressful transition for the kitten into his new home. This is the room where you will place his litter box(s), food, water, toys, cat tree/post for sleeping and scratching, and any other items he may be bringing from his current home (or our cattery, if that's the case), including the carrier and blanket he arrived in to act as a den and a secure place while he settles in. Leave the carrier in the safe room with him for him to hide in if need be - plus, it makes it easier to contain and transport him when you take him for his 72 hour vet check and when you decide to move him to a new area in your home. See our article on Litter Box Training for some additional tips on creating the safe room. As mentioned above, our kitten contract states that the kitten you take home from our cattery must be kept separate and apart from all other pets in your home for a full two weeks as this is the only way to determine the timing (incubation period) of an illness should one crop up after arrival. During this time, you may observe him with full confidence that the kitten has not been exposed to any outside contaminants since arriving at your home. If your kitten has come in contact (grooming, biting/playing) with other animals in your home - especially those who are allowed outdoor access (a dog going for walks, or a cat who free roams) our health guarantee is voided, as we have absolutely no control over what illnesses or viruses your kitten could potentially be exposed to via the other pets. 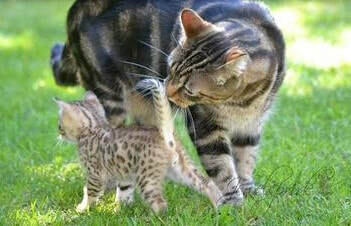 Smell is huge for cats and kittens. For this reason, try to bring something along with the new kitten from his current environment - a blanket, shirt, soft toy, etc that has absorbed some of the "scent of home" or of his litter mates. This will give him something that gives him comfort once his world is left behind to come to your house. Add a clean cloth or towel into the kitten's crate at this time, or on his tree if that's where he spends most of his time. You will make use of this item in a few days to bring out of the safe room and introduce to your existing pets to smell and get used to, so they know the smell or the new family member before he is ever officially presented to them. If the kitten decides to confidently wander beyond the zone you've created, let him do so. Follow him quietly while you observe him taking in the sights and sounds of his new home. Make sure the home is relatively quiet at this time - kids are at school, home reno construction is not occurring in your kitchen, etc. Also, remember to be careful about putting away and removing any and all triggers for inappropriate peeing before letting him out to explore. (See "Litter Box Training" for a list of trigger items to watch out for). Don't spend more than 15 minutes allowing the kitten to explore... it can be overwhelming and may be sensory overload for a young stressed kitten, so after 15 minutes gently entice him back into his room and play with him a few minutes more in the room before closing him off again from the rest of the house to relax and reflect on his positive experience. It's important to entice him, rather than carry and place him, back in the room. This will teach him how to find the room when he needs to - if he wants to flee the main living area or needs his quiet time. Teach him the route "home". Now, let your other pets back out and allow them to explore where the kitten has been to become more and more familiar with his scent with each passing day of completing this exercise. We recommend repeating this process at least twice a day during the quarantine period. It's critical at this stage to talk to your existing pet in calm tones, reassuring him that he is being a "good boy" while he is tentatively sniffing at the new kitten. If it doesn't disrupt the introduction, move in closer and place your hand on your pet and scratch or pet him in a way he likes so he feels like you are meeting the newcomer as a united front. Remember it's his house being invaded and not the other way around, so at this time priority must be given to creating a positive and encouraging atmosphere for the existing pet in welcoming his new housemate. NEVER reprimand (vocally or physically) the existing pet during this introduction. You will essentially be teaching him to resent the new family member if you do this. It will create a negative experience which is the opposite of what you want to do. If hissing and/or growling ensues (completely normal and expected!) remember that you need to allow the animals to communicate with one another without your interference unless there is clear evidence that one or both pets will be hurt in a full out brawl. If the introduction goes well, and the two begin to sniff or even lick one another, continue to keep a close eye but allow them to do what animals do - lick, groom, sniff, chase, etc. Theirs is a secret language that we do not have the benefit of translating in full, so this is where we need to "let nature take its course" so to speak. Well, I've put into one place all of the things that come to mind when discussing the issue of introducing a new kitten to a home with existing pets - I'm sure I've left some details out - as each situation I've helped deal with has had its own peculiar intricacies, as I'm sure yours will too. My main goal in writing this article is to give kitten clients and others a succinct resource containing the basic steps of a "successful" introduction. Feel free to tweak the procedure as it translates into your particular set of circumstances, and.... good luck! Like I've said, we've never had a situation where a new kitten and the existing pet have not become fast friends when the appropriate measures are taken for a stress free introduction. Heck, even when everything is done ALL wrong, the animals seem to figure it out on their own eventually, leaving us scratching our heads in amazement. It just depends on how smoothly and quickly you want it to go. Most of all, don't forget to enjoy your new family member during the process. He's only new and small once!